AT&T pushes iPhone over BlackBerry Storm | BlackBerry Blast! Isn't AT&T the largest carrier for BlackBerry devices in the US? It's hard to tell with this latest bit of leaked internal docs. 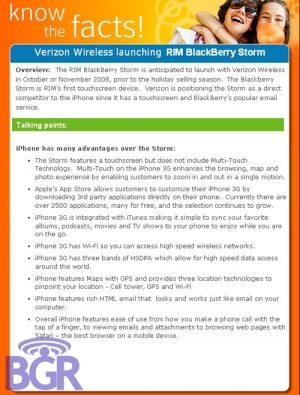 As you can see, AT&T is pushing the iPhone pretty hard against the BlackBerry Storm. I wonder how RIM feels about that?